Place oven rack in lower half of oven; heat oven to 350°F. Arrange opened cooking bag in 13x9-inch pan. Place ribs in bag with seasoning; shake to coat. Arrange ribs in single layer in bag, meaty side up. Pour water over ribs. Close bag loosely with nylon tie provided with cooking bag. Cut 4 small holes in bag to allow steam to escape. Bake in lower half of oven at 350°F. for 45 minutes. Meanwhile, heat grill. When ready to grill, carefully open bag. Remove ribs from bag; place on gas grill over medium heat or on charcoal grill 4 to 6 inches from medium coals. 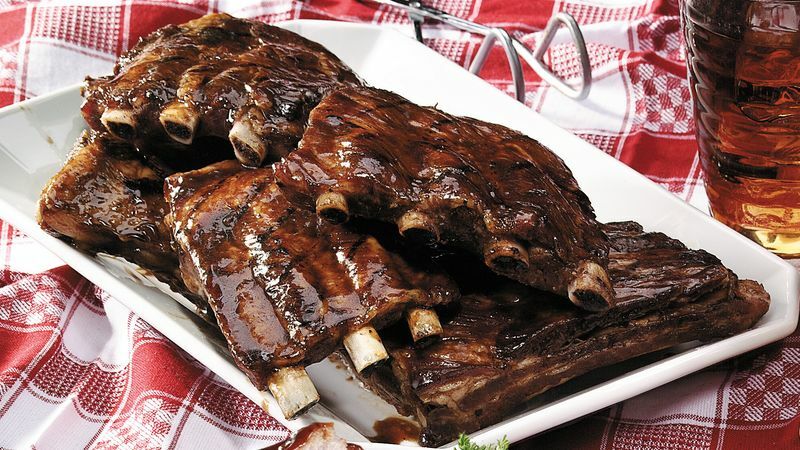 Brush ribs with barbecue sauce; cook 20 minutes, turning and brushing occasionally with sauce. Look for the pork chops cooking bag and seasoning blend in the spice, meat or gravy section of the supermarket. If the bag and seasoning mix is unavailable, season the ribs with jerk seasoning and place them in a foil packet for baking. Use your favorite barbecue sauce in place of the hickory and molasses sauce. Cooking bags reduce mess and consequently, your clean-up time. They also shorten the grilling time and seal in moisture so the ribs stay tender.